It’s easy for me to scoff at Disney and see it as just a massive commodified dream machine. I wasn’t raised on it the way many kids were, and with the exception of Pixar it hasn’t done a whole lot for me since I’ve gotten older. I’ve seen ​The Lion King ​like 1.5 times in my life, The Little Mermaid ​perhaps never at all, and I barely remember anything from the one time I watched ​Frozen. ​Even the much-beloved ​Coco​ left me feeling kind of meh. But of all things, 2012’s ​Wreck-It Ralph made me suddenly sit up and pay attention. Random? Perhaps. But that film managed a rare combination of dazzling visuals, lovable characters and a surprising story. Oh, ​and​ it was funny. In my experience, mainstream animation usually only manages one or two out of those four, so for ​Wreck It Ralph​ to hit all of them (and do so without resorting to a prince-princess narrative or a variation on “misunderstood kid upsets tradition and broadens the grown-ups’ minds”) was quite an achievement. As a result, I figured that its sequel ​Ralph Breaks the Internet​ would make for a fun Thanksgiving outing with friends. But I also knew not to expect too much because, you know, sequel. And Disney sequel at that. So I was surprised to catch myself both cracking up and tearing up throughout, and when I wasn’t doing one of those things then I typically just had a big dumb grin on my face, delighted by all the imaginative nonsense that filled every spare nook and cranny the film had to offer. Like its predecessor, ​Ralph Breaks the Internet ​is a bouncy Tigger of a movie, high-energy and big-hearted and more than a little spazzy. But it also has a lot to say – much has been made of how it both celebrates and skewers Internet culture, which might initially seem like a heady topic for a kids’ movie. Actually, though, it’s extremely appropriate: for better or worse, 2018 kids live in a web-saturated world, so you can bet they’ll be listening to what Disney has to say about it. Thankfully, I think the message is a healthy one, ultimately (if implicitly) reminding kids and grownups alike that, even when the web puts so much power at our fingertips, we cannot use it to control one another. Ralph Breaks the Internet ​picks up in real time, six years after the events of ​Wreck It Ralph. ​Gentle giant Ralph and plucky Vanellope, who went through virtual heck together in the last film, are now best buds, inseparable whenever they’re not clocked in at their respective arcade games. Vanellope, however, is getting stir-crazy in this rather routine existence, and her angst turns out to be timely as the arcade’s proprietor has finally (finally?!) decided to hook the place up to Wifi. Which has the sort of effect you would expect in a world populated by sentient bits of code. 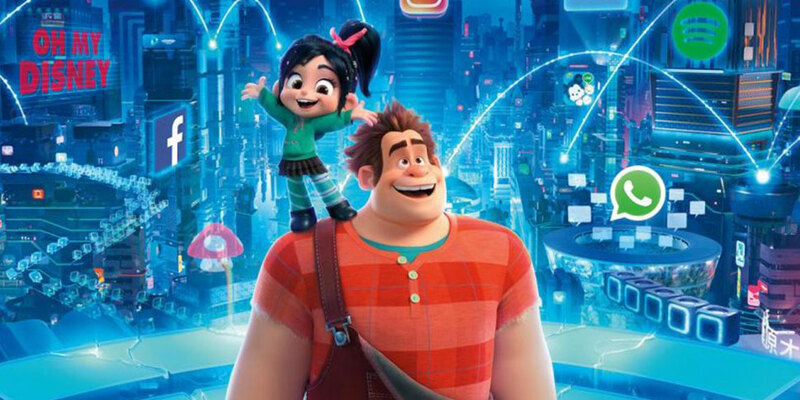 Through a rather convoluted chain of events, Ralph and Vanellope end up breaking into the Wifi router and then get zapped over to the Internet, which to them appears as a colossal futuristic city. Here, websites are buildings, hyperlinks are vehicles and the citizens are digital beings much like Ralph and Vanellope themselves, though they represent everything from search engines to pop-up ads to YouTube’s popularity algorithms. Without giving too much away, suffice to say that this crazy new landscape is precisely the adventure Vanellope was wanting – while Ralph, overwhelmed, can’t wait to return home to his comfy pile of bricks. This acute difference in their respective desires turns out to be a major test of their friendship, and (in my opinion at least) delivers a payoff much more poignant than anything I would expect from a non-Pixar animated film. Honestly, I’m surprised something like this hasn’t been made already. The device of turning the Internet into a physical place seems so obvious, so full of potential eye-candy, and so universally relatable, that I can’t believe it’s taken this long for Hollywood to try it out (and yes, I’m going to just ignore ​The Emoji Movie)​ . Regardless of the reason for that delay, though, I’m glad for it. Now that the Internet has been in widespread use for almost a quarter-century, it has matured into something of an establishment rather than a technological flash in the pan. It has put down roots, built up an infrastructure, and developed its own unique set of proficiencies and dysfunctions – much like any city. What is more, it’s come to pervade the lives of nearly all ages and demographics (see my piece on ​Eighth Grade f​or more on that, and forgive the shameless plug). Which means that it now has the emotional resonance to back up the eye-candy, making an animated film about it rewarding for viewers of all ages and not a mere flashy distraction (again, cough, ​The Emoji Movie). I’m also glad that it’s an animated ​sequel​ tackling these themes, though I never thought I would say such a thing. The achievements of ​Ralph Breaks the Internet ​are entirely dependent on its predecessor, but at the same time can only be pulled off by a sequel. This is because, at its heart, this movie is about how relationships inevitably change. And so it needs a relationship to​ change; one that was set up in the first film and evolves in the second. As a friend of mine pointed out recently, the ​Toy Story f​ilms prove that sequels can be wonderful when they exploit this dynamic, with every film in that franchise exploring a different evolutionary phase in the community of Andy’s toys. ​Ralph Breaks the Internet ​does the same with the friendship between Ralph and Vanellope, using the Internet as a catalyst for one of them to change dramatically, and as an object lesson to the other about the danger of resisting change. And in an age when our relationships are mediated more and more through the web, it’s ingenious to have a family film in which the protagonists’ relationship is also mediated through the web, but, like…​literally​. The upshot of all this is a reminder that people are who they ​are, n​ot who we believe or want them to be. At the film’s climax, Ralph needs to come to terms with the fact that Vanellope is no longer who she used to be, nor what he ​wants h​er to be…but rather than this destroying their friendship, it strengthens it. This motif is reinforced by an interesting little quirk of the Internet world, one that the film shows but mercifully never calls attention to. The virtual city actually has two types of “citizens:” the aforementioned digital entities, but also the web’s human users, represented by avatars that are sort of derpy Wii versions of the real-life individuals (who we do get to see from time to time, and are much more quirky, appealing and expressive than their digital counterparts). The subtext seems pretty clear – the online representation of a person is much less interesting than their flesh-and-blood reality. And as living things grow, so a friendship that grows along with the friends within it is more generous and rewarding than one that remains static. Admittedly, ​Ralph sometimes hits us over the head with all the stuff it’s trying to say, eager to ensure that its message is Very. Clearly. Understood. And normally that kind of thing makes me immediately check out of a movie. But for some reason it didn’t bother me this time, in part because I think its lesson is a valuable one, and in part because that lesson is just frosting on the cake. ​Ralph Breaks the Internet e​ssentially wants us to have a good time, and it delivers that. The wokeness and social commentary is secondary to its main objective, of bringing us along for the ride as two friends get catapulted into a wild, vividly-imagined new world. Ralph and Vanellope are fun to hang out with, and the world they’re in is fun to explore. So preach away, Disney. 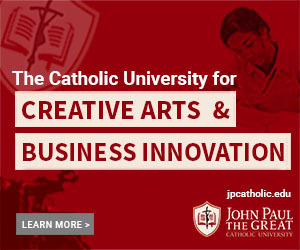 I’m listening this time.